Royal College Colombo emerged champions when they edged out St.Benedict’s College by 14 points to 10 points in the boys final of the Schools under-18 3 x 3 Basketball tournament worked off at Henry Pedris Basketball Courts Colombo yesterday. The tournament was organized by Sri Lanka Basketball Federation to pick a squad for the upcoming Asian under-18 Basketball tournament. Both teams were closely contested and strived hard to score points. However the strong Royalists took the lead and defended their basket while increasing the gap. Sameera Chanaka netted 13 points for the winners. The losers obtained the highest no of points from Poorna Nirmal (five points). Royal College ‘A’ team qualified for the finals by beating Royal College ‘B’ team by 12 points to 6 points in the semi finals. 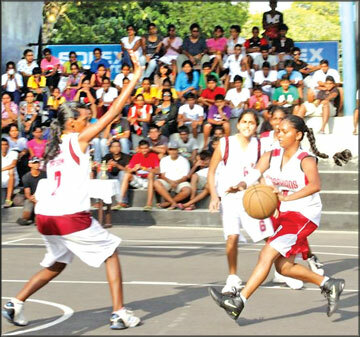 Sameera Chanaka was the highest point scorer for Royal ‘A’ with nine points while Ragu Ragawan was the best scorer for Royal ‘B’ with three points. St.Benedict’s College entered finals by beating De Lasalle College by 14 points to 10 points in the semis. Pramod (four points) and Fredrick (five points) did well for Benedictines while Anushka (five points) and Nimesh (three points) excelled for Lasallians. Meanwhile St.Joseph’s College Nugegoda clinched the women’s championship when they overcame St.Lawrence College Wellawatte by 10 points to 6 points. Even though Lawrence’s fought hard to make inroads to the game, the strong Josephian girls maintained their lead and did not allow the opponents to overcome them.Anne Stephanie(five points) and Imesha Thathsarani (four points) were the main contributors for St.Joseph’s. Nicola Wickramaratne (three points) was the best for St.Lawrence’s. In the semi’s St.Joseph’s Nugegoda beat Holy Family Convent Bambalapitiya by 12 points to nine while St.Lawrence’s beat St.Bridget Convent by 13 points to five.